Since this story hit the news media last week, several blog readers have inquired into whether neck manipulation can result in stroke. To summarize (and what I know is what the media is reporting – this is my disclaimer), Jeremy Youngblood, a 30 year old man in Oklahoma, died from complications of a cerebellar stroke following a visit to his chiropractor. While the media has not directly stated that Youngblood sustained a vertebral artery dissection, or a tear in the lining of the artery, this has been implied. The vertebral arteries (there are typically two – one on each side, traveling within openings through the vertebrae of the neck) supply blood to the brainstem and the cerebellum, which controls balance and coordination. Spinal fluid produced in the brain drains through a canal, called a ventricle, near the cerebellum. If a vertebral artery dissection occurs, inflammation occurs at that site in the blood vessel wall, and platelets begin to collect in that area. These platelet-rich clots then can break loose and travel to the brainstem and/or cerebellum, blocking blood flow to those sites, and resulting in ischemic stroke. The danger in cerebellar stroke is that if swelling occurs in the area of damage and tissue expands, spinal fluid may not be able to leave the brain if the ventricle is closed off. The brain will still continue to produce spinal fluid, though, raising the pressure within the brain as a life-threatening condition called hydrocephalus occurs. 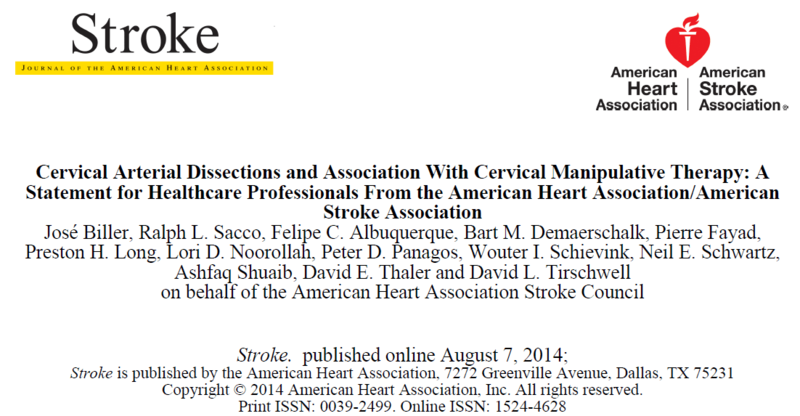 So – is there an increased risk of vertebral artery dissection following chiropractic neck manipulation? Many vascular neurologists would say they suspect the answer is probably, while acknowledging that many thousands of patients undergo this procedure without complications. In my own practice, I see two or three patients each year with a vertebral artery dissection that occurred somewhere in the midst of neck manipulation. However, often these patients sought help from their chiropractors in the first place for neck pain or headaches, so it is not possible to ascertain whether the dissection was already present. When patients state that within seconds of the manipulation stroke symptoms begin (sudden vertigo, nausea, vomiting, weakness on one side of the body, numbness on one side of the body, an inability to swallow – I have heard all of these as symptoms that have begun immediately following manipulation in patients later confirmed to have vertebral artery dissections with brainstem or cerebellar strokes on MRI), does that mean that the manipulation caused the dissection? Or was the dissection small, and worsened by the manipulation. Recently, the American Stroke Association issued a scientific statement about this controversial issue. In this statement, the claim is made that evidence is lacking to definitively associate the two, but that review of many population studies by the statement’s authors indicate an association between neck manipulation and vertebral artery dissection in young patients. The recommendation is that patients undergoing this treatment be informed of the potential, even if the risk is small. Approximately half of vascular dissections are spontaneous – meaning, there is no explanation identified for how the lining of the artery, called the endothelium, was injured. In those where a source of trauma is identified, not infrequently the trauma is relatively minor. 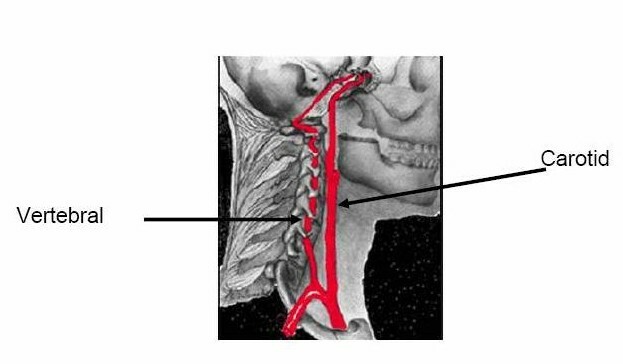 Some of the more interesting vertebral artery dissection stories I have heard are: head turning while swimming freestyle and feeling a “rip,” sneezing forcefully and experiencing sudden pain in the neck, lifting weights during a routine workout. There is the classic “beauty parlor dissection,” acquired when leaning back and extending the neck against the sink or dryer. One question is – how is it that a person can undergo the same activity 999 times without incident, and on that thousandth time be so unfortunate? What is it about circumstance and timing that makes the difference between a routine day at the gym (or at the chiropractor’s office), and the potential for stroke? While we know there are conditions that can place someone at additional risk for vascular injuries, such as Ehlers-Danlos syndrome or fibromuscular dysplasia, for the majority of vertebral dissection patients, there is no good explanation. Is there a test that could identify arterial stiffness? And thus have an objective measurement to tell people not to get a neck adjustment. Or do we have to ask our chiropractors if they know not to go beyond the 40% force of hanging by neck? From Science-Based Medicine by Mark Crislip comes this quote. I once calculated that the force of a neck crack is about 40% that of hanging by the neck and it has the same pathologic changes if it goes wrong. 1. that “risk” has a qualitative as well as a quantitative aspect. Chiropractic stroke survivors suffer lifelong, life altering consequences OR DEATH as a result of the manipulation. ………one can only assume that the RISK IS GREAT AND THAT A CHIROPRACTOR MUST NEVER RISK MAKING THE DISSECTION WORSE BY MANIPULATING THE CERVICAL VERTEBRAE! ……..One can only assume that the RISK IS GREAT. In July 2014 I suffered a vertebral artery dissection just as the 30 year old from OK. In my case I sought chiropractic care after I was involved in a car accident earlier this year. It’s hard to tell if the high-impact car accident or neck manipulation caused it. I was fortunate enough to survive and suffered a minor stroke (TIA), and have since made a full recovery. Prior to this incident I did not have any indicators that would make me high-risk for suffering a stroke. More education needs to be provided to patients – I definitely would have sought alternative care, now knowing the risk. My recommendation would be to not have hard manipulations done anywhere on your body. Risk may be small, BUT the risk is still present. Educate yourself, ask questions, know the risks! What do you think of an unidentified virus hypothesis? Please forgive my alarm……but are you suggesting that a virus might be the cause of the arterial damage and stroke that is occurring at an ever increasing rate in adults under the age of 45 yrs. who are free of risk factors for stroke and arterial damage and who have recently under gone a chiropractic neck manipulation? I respectfully state that the chiropractic profession does not need another hook to hang their hat upon……….they do not need another excuse to continue manipulating the highest neck over and over to treat a host of non musculoskeletal conditions without taking responsibility for the injuries and death they cause.